Banana Republic Non-Iron. Blue & White Tailored Slim Fit Chinos. Non-iron tailored slim fit. Slim leg opening. 100% cotton. Waist: 35". Banana Republic Smithfield Pants 35x32 Tan Cotton Wool Pleats NWT $78 YGI 8094 NWT $78 Photos tell the story best ... See detailed measurements of the item in photos using a tape measure — check them carefully as sizes vary! Check out our amazing inventory of other items by including the three letters YGI in your search. For example, type in your search ““ants 36x30 YGI ““to see all of our 36x30 pants in inventory. STOP! Before leaving anything other than positive feedback, please contact us to work out an amicable solution. At YGI, we honor our return policy 100 percent. So, if you are unsatisfied for any reason, simply return the item for a full refund. Our feedback speaks for itself and we want to earn your repeat business. Front slant pockets. Rear buttoned welt pockets. Zip fly with hook and eye closure. Made with added stretch for comfort. 97% cotton, 3% spandex. Slim through thigh, knee, and leg opening. PRODUCT DETAILS. New! Men's $89.99 Banana Republic "Tailored" Fit Dress Pants Size 35x32 NWT! 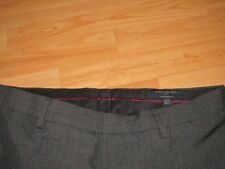 For sale is an original Men's $89.99 Banana Republic "Tailored" Fit Dress Pants Size 35x32 as seen in the pictures. BRAND NEW WITH TAGS! BANANA REPUBLIC. Color/Pattern: Gray, Brown Grid Plaid. Fabric Material : 65% Polyester, 35% Viscose. already own and fits you well, and compare. Front pockets : Straight on seam. Style : Flat front. Banana Republic Non-Iron Dark Gray Dress Pants Fine Stripe Men's 35 x 32 Condition is Pre-owned. Shipped with USPS Priority Mail (1 to 3 business days). BANANA REPUBLIC. 100% Cotton. 1 Button Through & 1 Open Back Pockets. Hook & Button Closure. Straight Fit, Luxury Italian Flannel. The shell is 37% wool, 23% rayon and 23% polyester, 9% nylon and 8% silk. The lining is 100% acetate. The color is navy. Perfect condition - no flaws or defects. NWT BANANA REPUBLIC Aiden Slim Rapid Movement Chino Pants color Optic White (other pictures are just to show style) Rapid Movement Chinos: Tailored performance chinos designed to do more. Engineered with stretch for a comfortable fit that keeps its shape, with added water and stain resistant properties so you stay looking your best. Mid-rise. Slim through thigh. Slim leg opening. Front coin and off-seam pockets. Rear buttoned welt pockets. Zip fly with hook-and-bar closure. Belt loops. #795219 Machine wash. Sits at the waist, slim through the thigh, straight leg opening. Zip fly closure. Machine wash. 100% Cotton. FIT & SIZING. Sits lower at the waist, straight through the thigh, straight leg opening. Machine wash or dry clean. I do however have pets, so there may be an occasional hair (sorry!). Item Size: 35x32. These pants are very versatile and great for many occasions. The material is thinner and lightweight. The front is flat. There is a thin interior lining. There are four pockets, two hand and two button rear. This BANANA REPUBLIC Slim Fit Pants are in excellent pre-owned condition. 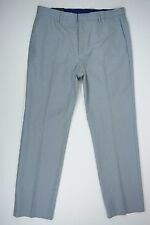 The pants have a beautiful gray color with a plaid pattern and are flat front. • Tailored Slim Fit. • 100% Wool. Pants have the following features. Banana Republic Pants - Size 35 x 32. 100% cotton. Excellent condition, no holes, stains or defects. Exact measurements are below. • Front Rise - 11.25 Inches • Across waist measured flat - 17.75 inches • Measured Inseam - 31 Inches • 100% Wool • Modern Slim Fit If you have any questions feel free to message me, thank you. Banana Republic. Linen Blend Pants. Material: 59% Linen, 41% Cotton. Color: Brown. Size: 35X30. SIZES AVAILABLE: 35Wx32L. Style # 581140. Made from linen, valued the world over for its softness and the ability to remain cool and fresh. 100% linen. COLOR: LIGHT BLUE. Non-iron tailored slim fit. 100% cotton. Hook n eye with inside button. Color: Brown Check. Condition: Nice and Clean no wear and tear. Size: 35" will fit 36". 2 Side pockets 2 Back pockets.